When Blue Anchor Station opened in 1874 it had only one platform, now the up side. The main station building, the only structure here when the line opened, is completely different in design from those at Washford and Dunster. In 1904 the GWR added the passing loop, down platform and waiting room, signal box and level crossing gates. The up platform is stone faced and the downside brick faced. Both were lengthened, together with the passing loop towards Taunton in 1934. The odd shape of the ladies room, built in red brick in 1904, is because it follows the boundary of the site. The waiting shelter between the main building and the ladies room, constructed in 1989, replaced an earlier one that rotted and became so dangerous it had to be demolished. The waiting room and booking office have been lovingly restored, using Great Western fittings, many of them originals to the station. The Blue Anchor Railway Museum, opened in 1986, is on the down platform at Blue Anchor Station, and is housed in the former waiting room, a brick built structure with a self-supporting canopy. The Museum is run by the West Somerset Steam Railway Trust who help staff the museum and raise cash for new acquistions. Many exhibits are loaned for short or long term, this ensures the museum always has new things to look at. 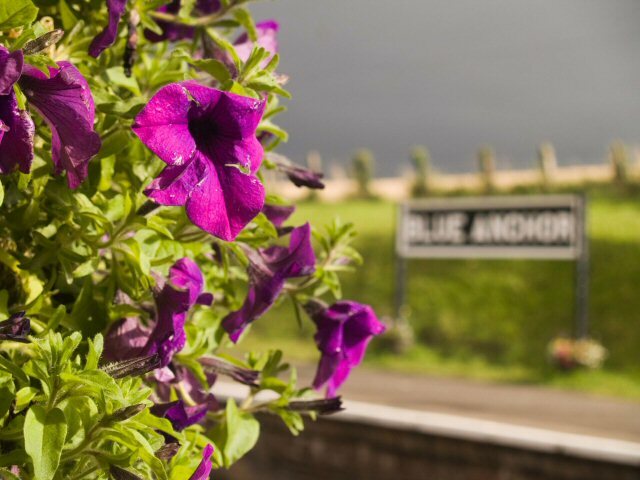 For lots more about Blue Anchor Station, including how to help, please visit the website of the Friends of Blue Anchor Station. Friends of Blue Anchor Station.